Suraj and I have been talking about booking a cruise since before the summer of 2016. We first started talking about it because I was mega excited about going on a vegan cruise. However, for one reason or another it hasn't happened, and then quite spontaneously, we decided to go to the travel agent closest to us and find out which holidays were possible during our availability. We had a number of restrictions in terms of dates, and of the few options that appealed to us, there was a cruise called 'A Canarian Christmas' which ticked several boxes! What drew me towards booking the cruise? We booked the cruise directly with Tui, and apart from a few snags, two on our part and others due to staff error, we were all set! As I mentioned earlier, we began in Tenerife, and on our final morning, we departed from there. We didn't see Tenerife during those times, but I had no unmet expectations about that. When we got to our cabin, we found a letter on the bed, suggesting that we speak with the head waiter of any restaurant when we dine there for the first time, so that they are aware of what we will and won't eat. I made the assumption that we wouldn't need to keep repeating it once we had done that. Towards the end of the cruise, we learned that we should have been assigned a section where we would be seated for each meal. This way we would have the same waiter who would be aware of our requirements. As passengers enter the restaurant, they are asked if they want to share a table with others. Being allocated a section, as opposed to a specific table, would mean that we could choose between sitting at a table for two and sharing. We ate well. However, at the end of the cruise, I took the opportunity to pass some feedback to the Food Manager through one of the Receptionists. She asked me to meet with the Food Manager, and that's when I learned that they had vegan cheese, vegan margarine, vegan bread and so on. So although we had eaten well, we could have access to many more options than those that were presented to us. Here are some of the (inclusinve) meals we had on the cruise. The image below shows the meal that we enjoyed in Mistrals restaurant, which isn't included in the package. 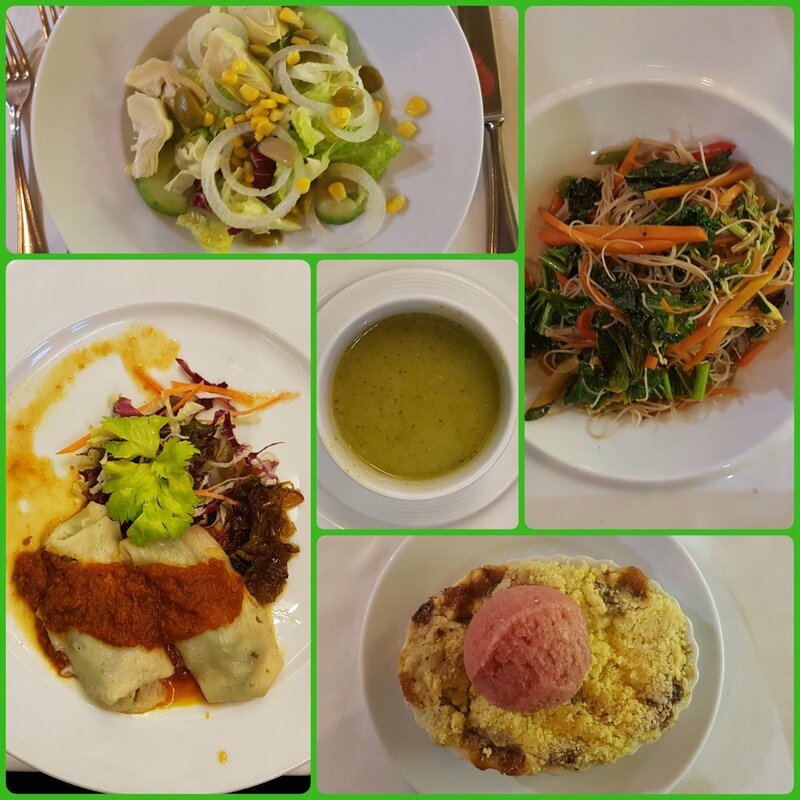 It was one of my favourite meals, because of the food, the service and the ambience. How well did we eat when we were on land? We met and chatted to a number of passengers on the cruise. Some of them were on their first cruise, whilst others had lost count of the cruises they'd been on. you pay for what you get, so if you pay less, the service is likely to be less spot on and there may be fewer options in terms of food, drink, facilities etc. Would we go on a cruise again? Definitely! Next, I would love to go on a vegan cruise.